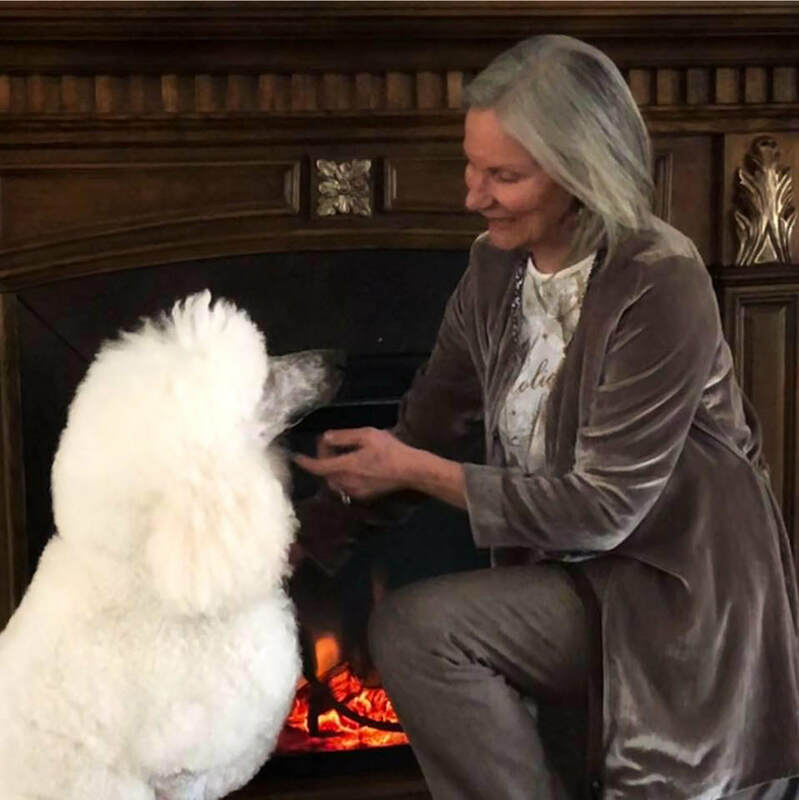 We LOVE the Standard Poodle Breed and if you are here, then you must love the breed too or are here to learn more about them. Our poodles are loved family members. If you would like to know more about us or our dogs, please follow the links above. All of our puppies are sold on a spay/neuter contract unless otherwise agreed upon to a show home. This will be Wispynook's only litter this year. If you are interested in a puppy from this litter, please fill out our puppy questionnaire here and submit it to us for consideration. Our list is filling up fast! Click the button to see the first Wispynook offspring to be donated to BASK through the generosity of Berkshire Poodles. BASK is a non-profit service dog foundation that provides and supports specially trained assistance dogs to enhance mobility and independence through canine partnerships. They are a 501c3 non-profit organization. You can follow BASK of Medway, MA, on Facebook. At this time, BASK is providing balance and PTSD dogs to clients who live in Massachusetts and the Southern New England area only. Because all of our dogs are specially trained for each client, our clients must live within a reasonable driving distance of our training facility in Medway, Massachusetts so that they can attend training with their dog. Any disabled veteran or first responders with a medical diagnosis of PTSD is welcome to apply for a service dog. We here at Wispynook got our start through our passion for providing love and joy through therapy work with the residents of nursing homes. It always warms our hearts and gives us great joy when one of our family members chooses to dedicate themselves to the time and training involved to become a member of one of the therapy programs offered then go out to provide the same joy to others. We have provided for you the links to two of the agencies through which you can attain this training and certification if you wish to do the same. Nancy's goal since she brought her boy home was to train Xander to do service work. She has done an amazing job with their training! Xander not only has excelled at obedience and his prep for his CGC title and therapy work; he has learned several tricks as well. Xander obtained his AKC CGC in June of 2017. Nancy says "Xander loves visiting with the elderly as well as taking part in “Reading With Rover” events at their local library." She also says "Xander is such a great well rounded boy. He has far exceeded everything I had hoped for in a Standard Poodle." Click on image for gallery of Xander working. Barbara and Orion have been with Love on a Leash for four years. Orion earned his AKC CGC before he was six months old! He was Certified by Love on a Leash (LOAL) when he was 1 year old and earned his AKC Therapy Dog Title after completing 50 visits thanks to the dedication of Barbara to her mission. ​Barbara and Orion are now very close to earning their AKC Therapy Dog Advanced Title which requires 100 visits. Barbara says "we love visiting The Hospice House and Greenbriar Community Care Center. I was so happy that Nancy went with Love on a Leash too. Brothers both doing what they do best - bringing comfort and joy to anyone in their path!" Orion also visits with the Girl Scouts and Summer Bible School as he loves children. Orion has his own Facebook page where you can follow him. 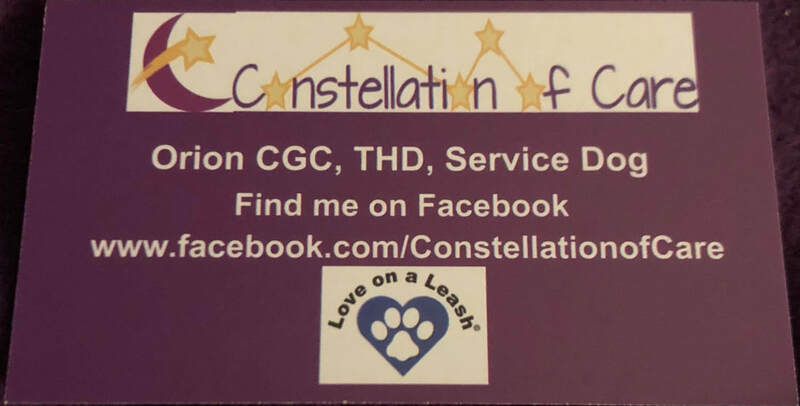 You can find him here at Constellation of Care. Click on image for gallery of Orion working. Whether you are looking for a loving family companion to hang out around the house, go for car rides and on hikes or are looking for a great friend and candidate for agility, fly ball, obedience or service work (therapy, tracking) you have come to the right place. Our dogs were chosen for their great temperament and learning ability. All of our dogs have attained their CGC's (Canine Good Citizens Certs) and are used in therapy work with the exception of those currently in the show ring. Some are in training for obedience and/or rally and others are being shown in AKC Conformation towards their championships. Not only do we strive for great temperament, but also for proper structure and excellent health. All our dogs are fully health tested before breeding. Please see 'Our Dogs' page for information on our breeding dogs and their health testing results. We expect to have two to three possible litters a year between both households. It is very important to us that the pups get plenty of one-on-one attention so each are emotionally ready for their forever, loving homes. What is the difference between a show prospect puppy and a pet puppy? All of our litters are bred to the PCA (Poodle Cub of America) standard by carefully choosing dams and sires for the best outcome. A show prospect puppy is a puppy that excels to the Breed Standard in structure & show attitude and could compete in the show ring. A pet puppy is one that may have a structural aspect that would not allow it to be competitive in the conformation ring to attain a championship. Both show and pet puppies have the same wonderful temperament, trainability and healthy constitution. Both come with the same health guarantees, the same puppy packets and the same lifetime support from Wispynook Poodles. A pet puppy MUST be spay/neutered. We DO NOT condone cross breeding Poodles with other breeds to make doodle crosses. Please DO NOT ask us for any ! IS THE STANDARD POODLE THE RIGHT DOG FOR YOU? 1) Do you have time to spend with your dog? The Standard Poodle is very calm and well behaved in the house, but needs the opportunity to run and play daily. They absolutely need human interaction and mental stimulation. 2) The Standard Poodle has a sensitive, loving disposition. They do not do well with a heavy hand. They take corrections to heart, so all that is needed is mild, consistent training. 3) Are you looking for a hypo-allergenic breed? Well, than this is the perfect one for you! 4) Do you like to brush & groom your dog? Although the poodle's coat is low shedding, they need to be brushed to keep the coat from becoming matted from the shed hairs and keep their skin healthy. Also, they need to have a bath about once a month. They do not get the typical "doggy" smell but because they have hair like humans do, instead of fur, there hair does need regular cleaning. 5) The Standard Poodle ABSOLUTELY needs to have their coat trimmed monthly or six weeks to keep them tidy and their coats manageable and clean. You will need to find a good groomer or can learn to groom your new friend yourself. It is not hard and the time spent doing it is a good bonding time. 6) The Standard Poodle loves to play fetch, go on hikes, go swimming and go for car rides. They are perfect camping, hiking companions. 7) Because of their love for the outdoors and desire to please their owner, they do well in all types of dog sports, i.e., obedience, rally, tracking, agility, ski-joring, to name a few; and even have been trained for herding. Their intelligence allows them to be very versatile.